NBC’s ‘State of Affairs’ Loses Showrunner!!! When I saw the headline that Ed Bernero had stepped down as showrunner for the Katherine Heigl vehicle ‘State of Affairs‘ on NBC, I originally thought, brashly, the blame was to place on Heigl, who is notoriously difficult to work with. Turns out Heigl had nothing to do with the clashes on set. It was mainly disagreements with creative matters between Bernero and creator/executive producer Joe Carnahan. Bernero was brought on to help steer the thriller set in Washington, D.C. That features Heigl as A CIA officer plucked from the field to become the president’s daily briefer, assuming responsibility for targeting America’s most critical threats while navigating the unique lifestyle that comes with such a high-powered job. All the while, she is investigating the circumstances regarding the death of her fiancé. Alfre Woodard is featured as President Payton. Dario Scardapane is closing a deal to move into the vacancy made by Bernero’s step-down. Scardapane has experience with creating and running a television series. He is a successful writer/producer who will draw on his experiences with ‘Trauma‘ and ‘The Bridge‘ to launch this series to a ratings success for NBC. I’m sure the network is holding their collective breath and hoping this is the last hitch this show sees. With this being Heigl’s return to series TV since a very public and ugly departure from ABC’s serial ‘Grey’s Anatomy‘ they can only hope this is the end of the turmoil. 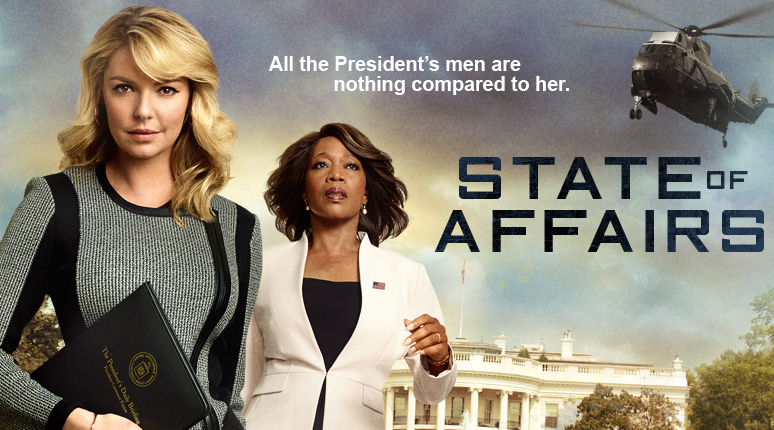 ‘State of Affairs’ is set to debut November 17. Netflix Unveils Trailer For ‘Lemony Snicket’s A Series Of Unfortunate Event’!!! Netflix Tempts Us With A Trailer For ‘Luke Cage’!!! Christina Hendricks Tops Cameron Crowe’s ‘Roadies’ For Showtime!!! This entry was posted on Friday, August 15th, 2014 at 5:39 pm	and is filed under News, Television, Uncategorized. You can follow any responses to this entry through the RSS 2.0 feed. You can skip to the end and leave a response. Pinging is currently not allowed. « Trailer For William H. Macy’s Directorial Debut ‘Rudderless’!! !